Hovering just above the sandy shores of Saadiyat Island like an upturned colander washed up on the beach, the metallic-domed roof of the new Louvre Abu Dhabi doesn’t give much away from the outside. A cluster of white blocks spreads out from beneath the great cupola like scattered sugar cubes, forming little streets and squares, like a village in the desert. And compared with the garish mirror-glass towers of the city’s seafront corniche across the water, this multimillion-pound palace of culture seems almost modest. 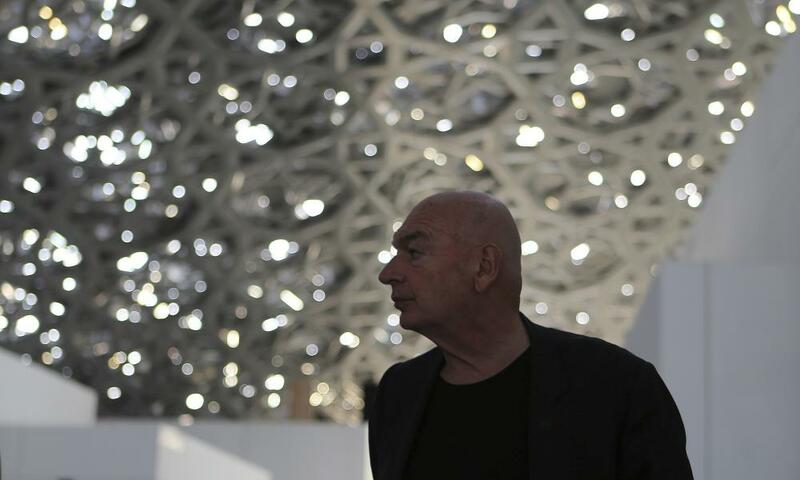 “I wanted to create a neighbourhood of art, rather than a building,” says Jean Nouvel, the French architect of the new Louvre, which opens to the public on 11 November, and enjoys the use of the venerable Parisian institution’s name in a 30-year deal worth over £663m – a first for a museum outside France. 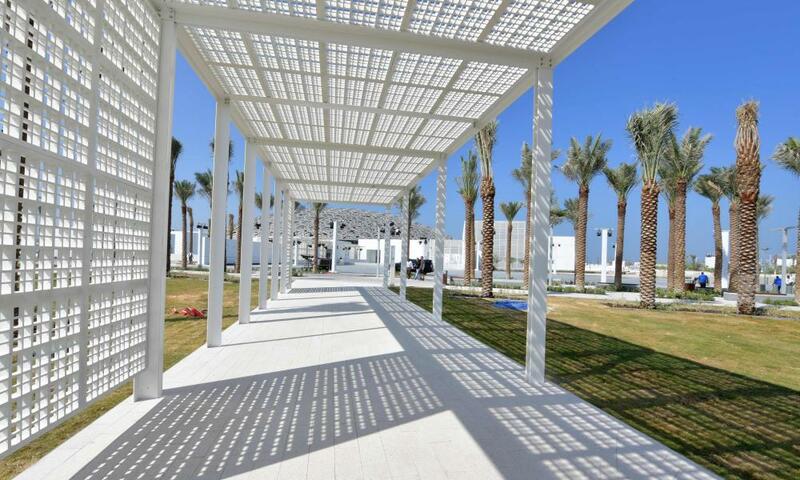 ‘Between an Arab medina and a Greek agora’ … an outdoor section of the Gulf outpost. Standing beneath his vast cosmic dome, with rays of light piercing through its layers of star-shaped latticework, casting dapples across the facades of the white concrete buildings, you feel transported to another realm. Water laps at the base of the stone platform, flowing beneath the canopy in reflecting pools that cool the air and bounce more ripples of light back into the space. Architects are fond of talking of painting with light, but here it rings true. The combined effect is mesmerising. Inside, works by Jackson Pollock and Mark Rothko hang a few steps away from others by Henri Matisse and Vincent van Gogh. 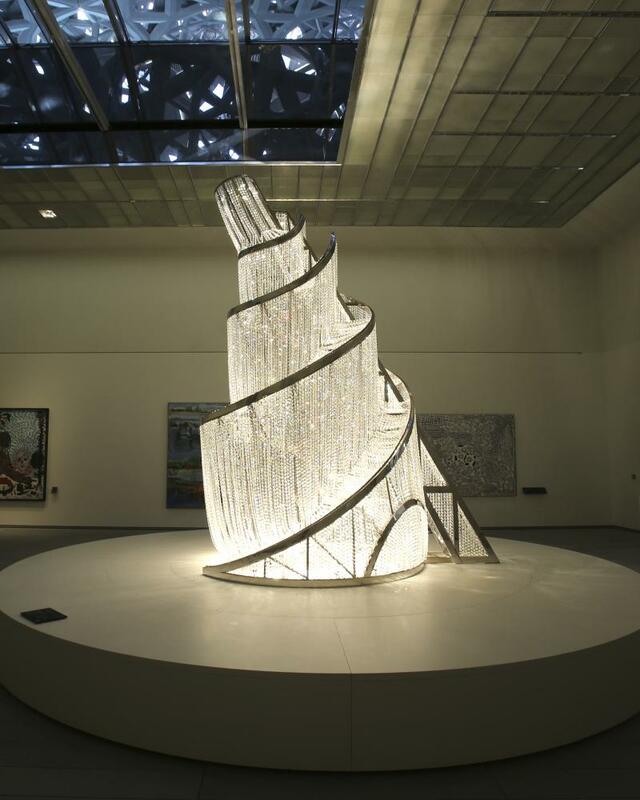 Highlights include a Grecian sphinx from the sixth century BC, Leonardo’s portrait of an unknown woman, and Ai Weiwei’s crystal-encrusted recreation of Tatlin’s Tower, which could have been plucked from the ceiling of an Emirati palace. 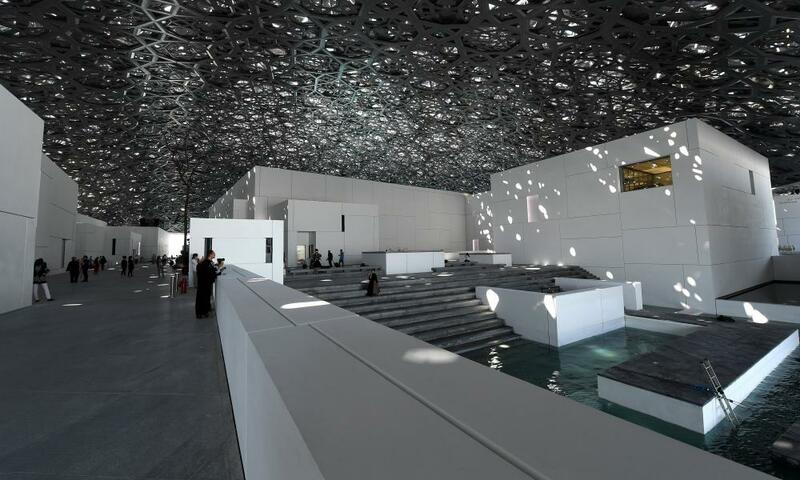 The Louvre Abu Dhabi is the first completed building in the oil-rich emirate’s long-delayed $18bn plan for a lavish cultural island, dreamed up more than a decade ago in the heady days before the global financial crisis. It was to be a prestige destination, aimed at luring visitors with cultural cachet, in the continuing competition with its more glamorous neighbour, Dubai. Alongside the acres of luxury villas and golf courses (which were the first things to be built), there was to be a gargantuan new Guggenheim Museum by Frank Gehry, seven times the size of its New York home, designed as a topsy-turvy heap of cones. Dappled interior … sunlight bursts through the randomly perforated double dome. It was to be joined by the Sheikh Zayed National Museum by Norman Foster, in the shape of a racing falcon’s wing (in honour of the sheikh’s favourite pastime); a maritime museum by Tadao Ando, as an angular vault rising out of the sea; and a performing arts centre by the late Zaha Hadid, modelled on a writhing tangle of ectoplasm. None of these have yet broken ground. “It can be catastrophic when buildings are parachuted in by international offices, without any roots in a place,” says Nouvel, whose design was the most refined of this supercharged architectural petting zoo. He knew his high-octane neighbours would rise to over 80 metres, so he wanted to hunker down and speak more softly; his dome floats less than 30 metres above the shore. Towering figures … Fountain of Light by Ai Weiwei. “We must always be sensitive and contextual, even where there is no apparent context,” he adds, describing finding an empty patch of sand when he first visited by helicopter, long before there was a bridge to the mainland. His starting point of a loose-fit medina was a canny response to the vaguest of briefs, which came out of the blue, without any specifics attached. “A classical museum of civilisation,” is what the sheikh asked for in 2006, before the Louvre had been identified as the preferred partner to fill the building’s halls. But the built-in flexibility has had the benefit of making a place that feels like a historic museum that might have grown organically over time, as if taking over a series of existing spaces that have been adapted and retrofitted. Comprised of 55 room-sized buildings, organised in a carefully organised jumble, no two galleries are alike. Ceiling heights vary from the intimate to the lofty, materials range from dark bronze to silvery marble, while atmospheres oscillate from the sepulchral to the light-flooded, depending on whether it is Qur’ans or Mondrians on display. The as-found quality extends into the sea too, where random rows of mooring posts rise out of the water like the ruins of something that once stood here – or the foundations for an expansion to come. In a James Bond-ish touch, VIP guests will be able to arrive by boat, gliding in to dock beneath the sparkling dome. There is an air of sheikh chic to it all and, in places, it feels like they had too much money to spend. Nouvel had the rare luxury of designing everything in sight, from the leather furniture to the light fittings, and some of the finishes betray his penchant for a touch of bling. Did he have too much money to spend? … Nouvel walks under the dome. Light filters into the galleries through glass ceiling panels moulded in 17 different patterns; each room has its own “stone carpet”, mined from a different exotic part of the world and inlaid with bronze edging. It verges on the tacky – although, by the standards of petrodollar glitz familiar to the region, it is a model of restraint. In one surreal moment, it looks as though the architect has gone full art deco, until you realise you have entered newspaper magnate Lord Rothermere’s 1920s apartment, transported here from the Champs Élysées. As a “universal museum for the 21st century”, the galleries take visitors on a global journey through 12 chapters, arranged chronologically from prehistory to the present day – a radical hang that is intended to reveal common threads between different cultures and regions throughout the ages. Verging on tacky … the ‘stone carpet’ in one of the galleries. “It is the first time we not only have the decompartmentalisation of museum departments, but a means of reflecting on unexpected dialogues between artefacts,” says Jean-François Charnier, scientific director of Agence France-Museums , the organisation charged with coordinating the 300 loans from 13 French museums, which will decrease over time as the museum builds up its own collection. 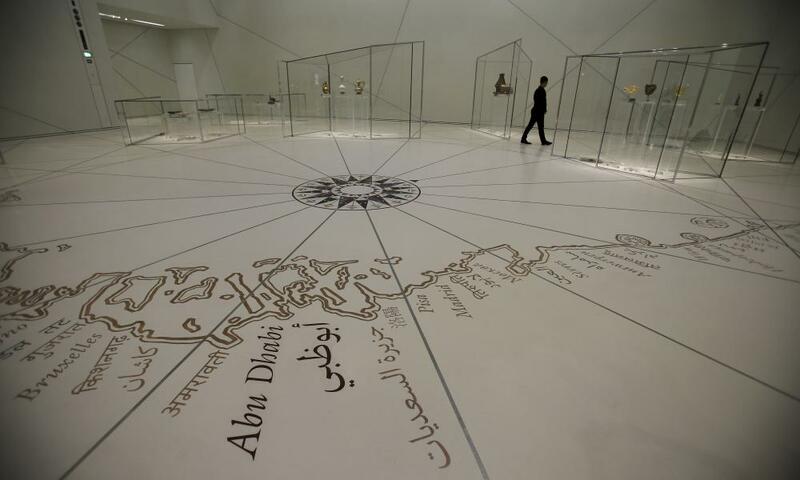 The alliance makes a fitting partnership, given that Abu Dhabi is about as old as the Louvre itself – the Bani Yas Bedouins settled here in the 1790s, as the museum opened its doors in Paris – but an unsettling undercurrent remains, with a sense that some things haven’t moved on since then. Outside the press opening, south Asian construction workers are busy putting the finishing touches to the landscaping in the scorching midday sun, a reminder of the controversy over their working conditions that has dogged the project from the outset. 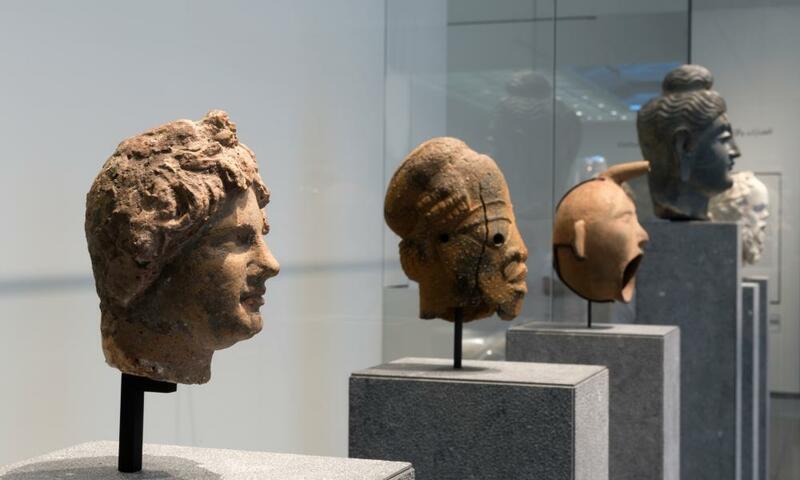 Artefacts of empire … exhibits in the museum. A 2015 Human Rights Watch report found that, despite the construction of a spotless workers’ village, many labourers on the Louvre project were still being kept in conditions akin to indentured servitude, forced to work for months without pay until their illegal recruitment fees were repaid, and subject to summary arrest and deportation if they complained. “See humanity in a new light,” trumpets the billboards leading to the new Louvre, and that is exactly what this project forces you to do. Like many of the priceless objects on show, commissioned by despots and dictators throughout the ages, the nature of how the building was made is all part of the story, a troubling facet to this spectacular cultural artefact of our time.